La Maison de Bavière is directly located on the longest linear park in Canada, only 15 minutes from Saint-Sauveur and less than 30 minutes from Mont-Tremblant. 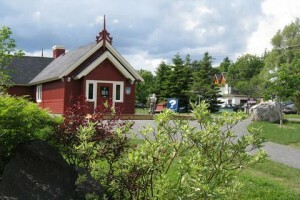 Val-David really stands out as the ideal place to stop for a stay and enjoy a tremendous variety of activities. There are only few places in Quebec where you can practice so many outdoor activities as you can in Val-David : skiing, skating, snowshoeing, walking, hiking, cycling, canoeing, kayaking…. Discover the village of Val-David with its artisans, its cafes and pubs. You can visit one of the numerous artists of the place, or have a hike on the Condor Mountain (birthplace of the first climbing school in Quebec). Stroll at “1001 pots” (the most important exhibition of ceramic in North America) or buy local products (produits du terroir) at the summer market of Val-David.